We’re parked near the Opera House, the meter is full and my sweet-tooth is talking to me. 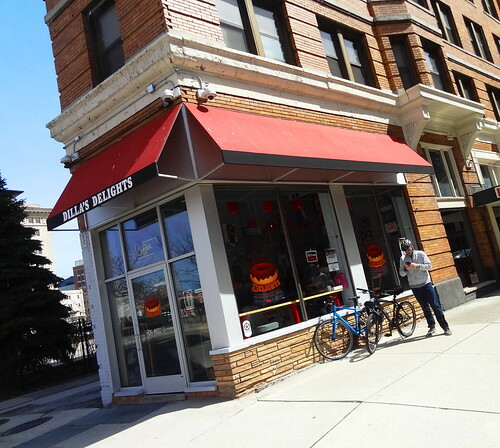 Good thing Dilla’s Delights is only a short walk away. 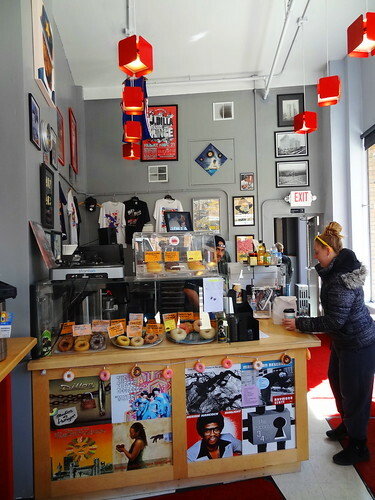 The donut shop is owned by Herman Hayes, aka Uncle Herm to late Detroit Hip Hop legend J Dilla. Dilla’s two daughters are the ‘delights’ in the equation. 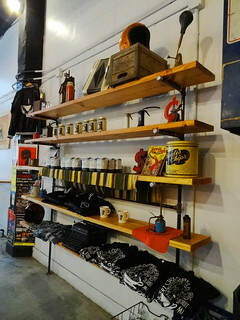 The petite shop is tucked into the end space on the ground floor of the Ashley Building, decor consists of photos of old Detroit, baseball players, portraits and posters of Dilla. The main attraction of course is the donuts. 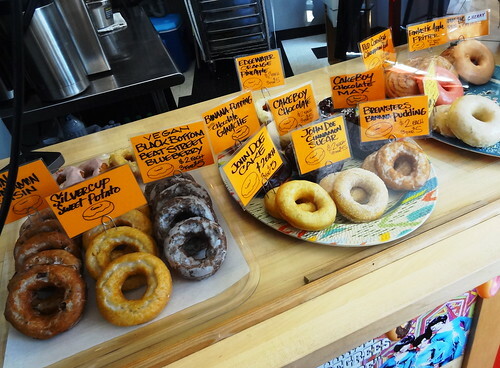 Made with organic flour and fried up in the kitchen at Avalon bakery, Uncle Herm offers 15 flavors including vegan options. It’s a tough decision; Brewster’s Banana Pudding Cake, apple fritter, Cakeboy Chocolate Cake, cinnamon raisin, blueberry. We follow the advice of the man behind the counter; one of the original classic John Doe Cake and a raised and glazed lemon lime; good advice. We step inside, walk a few feet then, taken aback by the beauty of the Great Hall, we just stop. Wow. 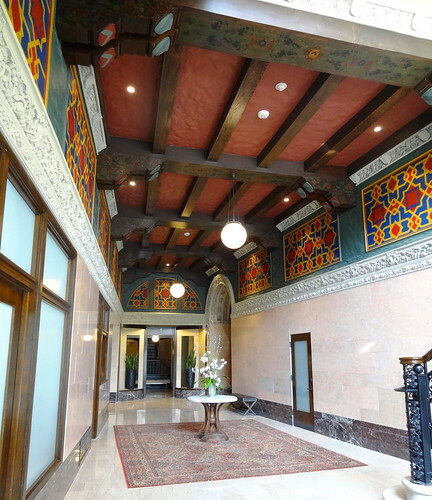 Pink marble walls are topped by ornate plaster moldings, a beamed Medieval ceiling with cayenne-colored plaster rises above, glossy wood frames doorways and windows, simple globes and new recessed lighting light up red, yellow and blue designs high on the walls. 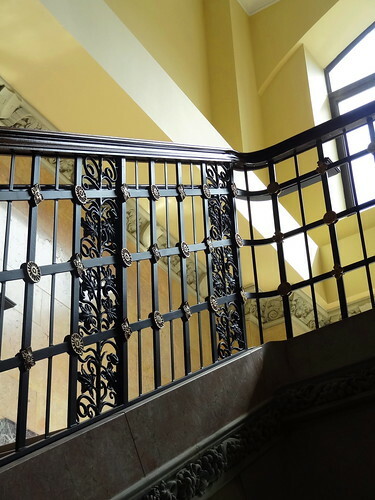 The grand staircase is to the right, more pink marble and ornamental bronze grillwork. A quick trip to the second floor reveals terrazzo floors, divided storefronts and a large window overlooking the city. Returning to ground level we walk the hall marveling at the restored archways, magnificent plaster moldings, original floors. 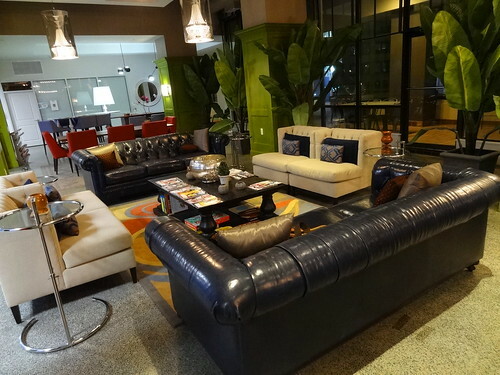 A lounge area displays large historic photographs of the Metropolitan in different phases. Decor hinges on Mid-Century here, the fireplace looks inviting. 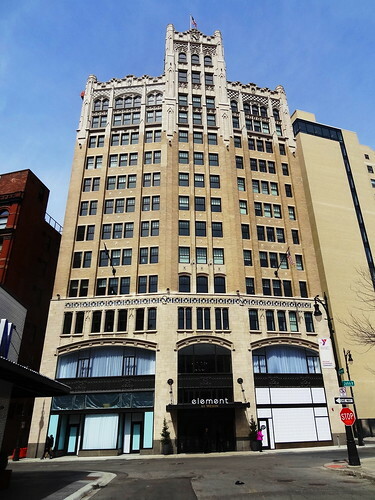 The Roxbury Group spent $33 million restoring this unique skyscraper, they’re the same group that restored the David Whitney Building/ Aloft Hotel. Nice job and Thank You! Farmer Street has been completely transformed. 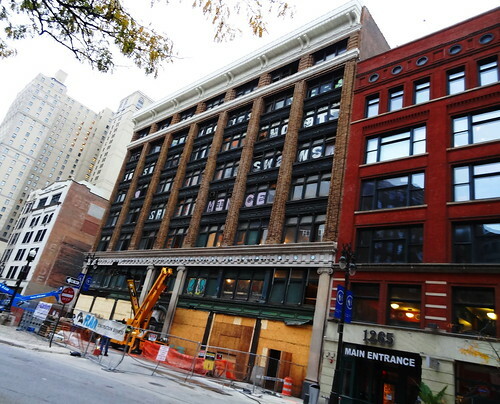 With the creation of the Shinola Hotel a new building stands where a short time ago was just a gravel lot. 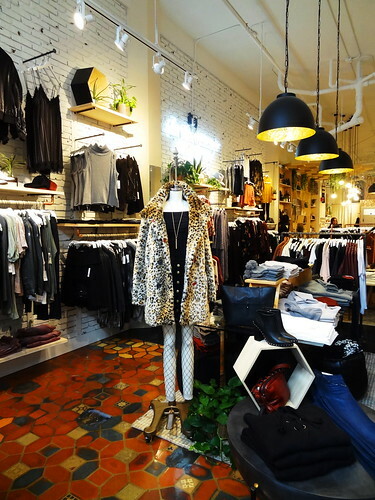 Up for a little shopping? 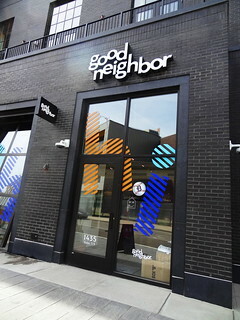 Good Neighbor, a clothing boutique, sells casual pieces for men and women, if you’re into Levi’s you’re in luck, they have a large selection. Other items include jewelry, handbags, jackets, shoes and scarves. The Velvet Tower is next door, Long Island transplant Emily Bernstein has been collecting for over 2 years to amass enough vintage pieces to open her own resale shop. 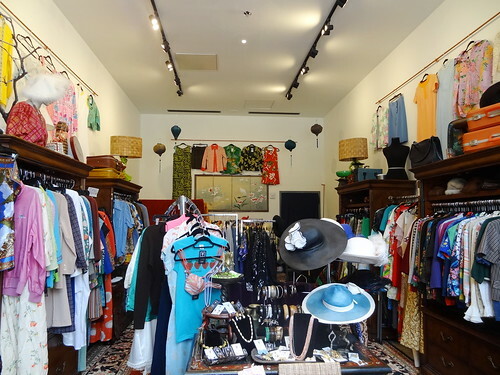 Pieces are high quality, she has a nice variety of casual and upscale pieces, hats, shoes, household and fun things. 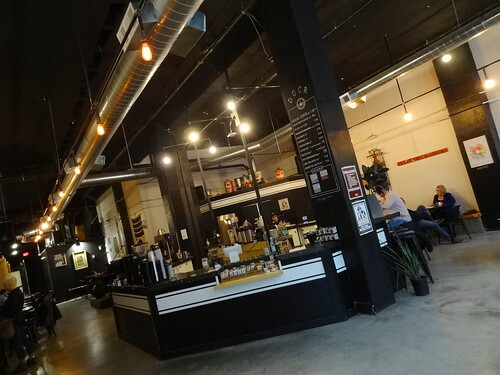 Madcap Coffee has just opened its first location outside Grand Rapids, time for a coffee break. 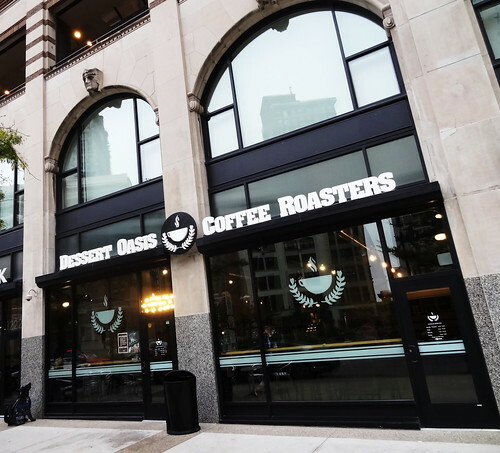 Roasting beans and serving coffee since 2008, we have enjoyed their offerings for years; now that they’ve arrived in Detroit we can indulge more often. 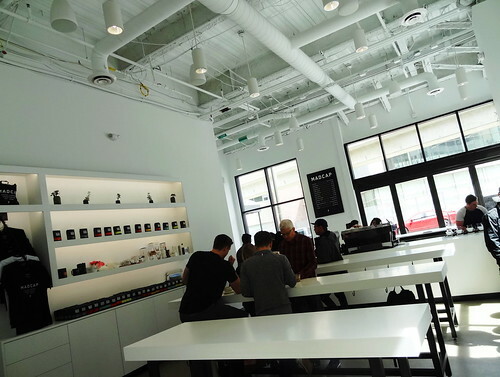 The all white interior is accented in black, shelves hold logo merchandise, bags of coffee beans and several styles of pots to brew your own. I’m glad to see they have nitro cold brew; one for me and one for Kris and we’re off again. 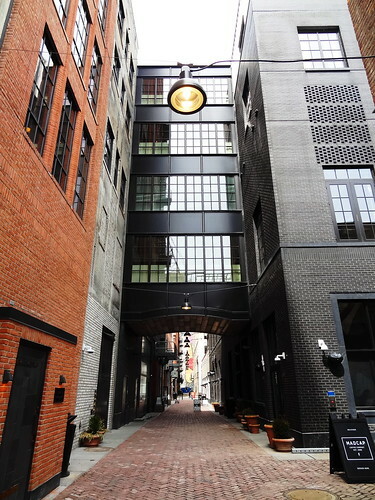 A sharp right out of the building leads us to Parker’s Alley, a block-long walkway behind the new Shinola Hotel, a few independent storefronts face the alley. 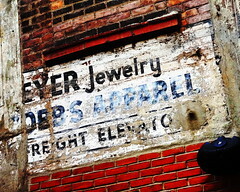 Remnants of old painted advertising still clings to the brick wall. Around the corner a 4-story enclosed bridge connects the hotel to the new building, large lights illuminate the walkway, planters already celebrate Spring. Organic raw juice company Drought has a location here. Their cold-pressed, glass-bottled juice has become the leading brand in the Midwest. 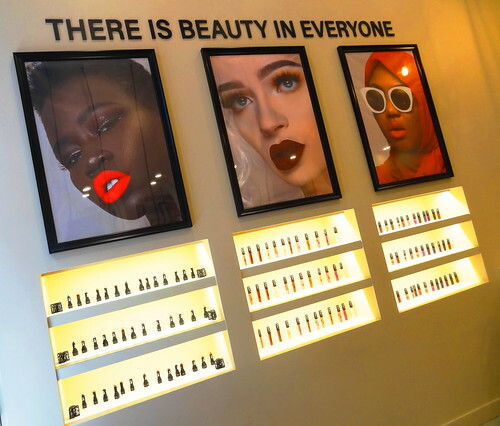 The Lip Bar cosmetic boutique makes products that are vegan and cruelty-free. Have a seat on a swing at your own personal vanity; sample lipstick and lip gloss that moisturize your lips thanks to shea butter, coconut oil, avocado oil and vitamin E. Fun colors and cool packaging; what more could a girl want? 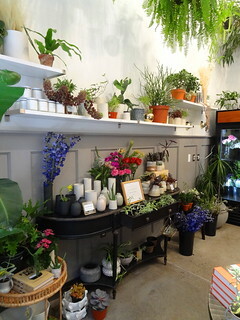 The smallest space belongs to Posie Atelier, a charming florist that also sells houseplants, unique gifts and jewelry. 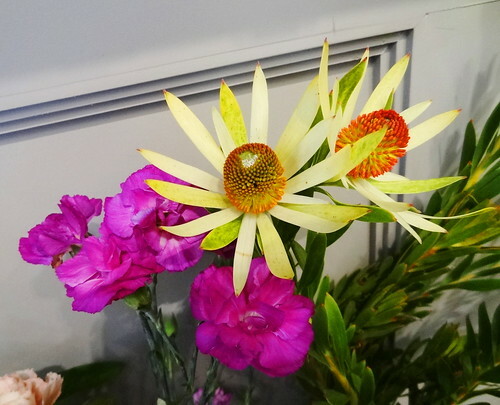 I love the colors of exotic tropical flowers. Time to eat. 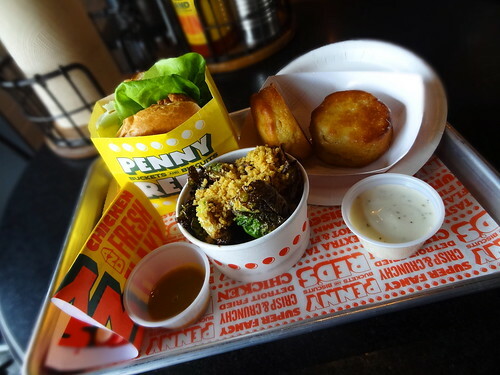 Penny Red’s (Buckets and Biscuits) is a carry-out fried chicken stand located on the Farmer St side of the building. The modest space with wood paneling has a mid-century feel to it. There’s one window for ordering, one window for pick-up. 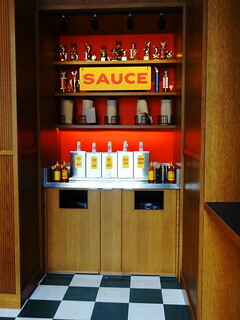 Shelves in a recessed area hold rolls of paper toweling, secret recipe sauces, and disposable wood silverware. 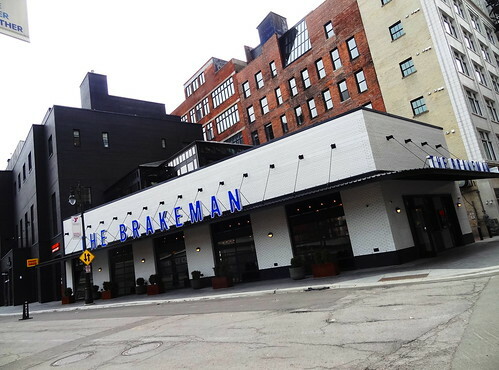 We place our order and are given a pager, we’re going to eat next door in The Brakeman. A simple doorway leads us into the beer and rec hall. It’s one huge, attractive, industrial-looking space that will seat 200 people at community or high-top tables. 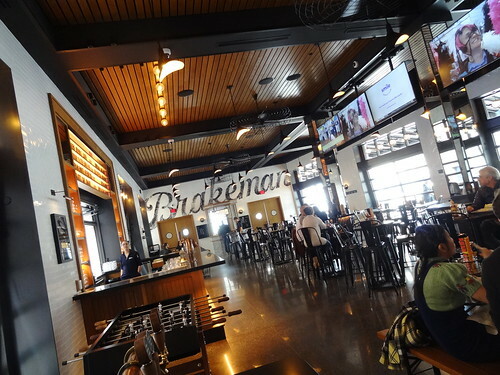 There are two bars, big screen TV’s, foosball, table shuffleboard, beer pong and ping-pong tables. You can even reserve a Beer Tap Table. Roll-up doors and windows run the length of the front and back of the building, this place will be packed in nice weather. 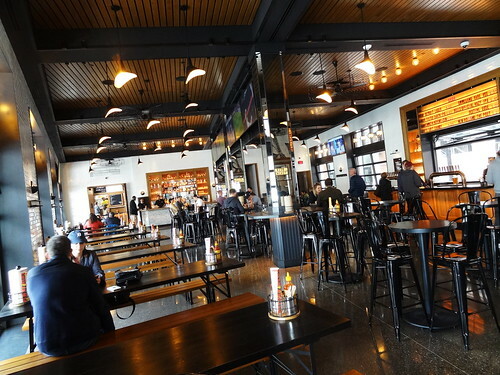 A token booth stands at the far end, $7 gets you a token good for a single draught beer or a flight of three. I take my token to the bar serving beer and select a Short’s Soft Parade Shandy. 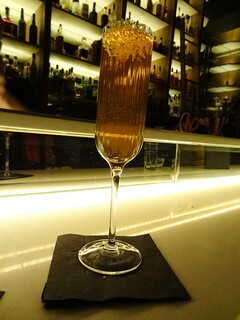 The second bar serves cocktails and accepts cash. The pager goes off, I pick up the food and meet Kris back at our table overlooking Farmer Street. The food looks and smells delicious. The Classic sandwich is a chicken breast topped with urban ranch, sweet pickle and hot honey; very tasty. The crispy brussels are tender and flavorful with a smoked maple sauce and crunchy topping. Honey butter biscuits come dry or dunked, we got ours dunked, yum. Several times today I thought to myself, where am I? People fill the sidewalks and alley, empty spaces are disappearing as new buildings take their place. Travelers come and go from a long forgotten skyscraper. My eyes can hardly believe it. Detroit is alive and well. When Michigan became a state in 1837, Detroit was chosen as the Capitol city. An existing courthouse on a triangular piece of land surrounded by Shelby, Griswold and State streets became the state capitol building. In 1847 when the city of Lansing became the new capitol of Michigan, the building in Detroit was used as a high school until it burned down in 1893. The land was then converted into a park with plantings, benches and a fountain; Capitol Park was born. 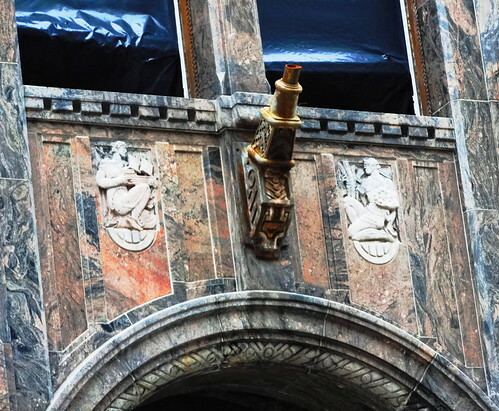 Detroit experienced rapid growth during the late 19th and early 20th Century, buildings went up all over downtown, architectural styles include Romanesque, Colonial Revival, Victorian, Beaux-Arts and Art Deco. In Capitol Park that half-acre plot of land was soon encircled by 17 buildings for a block in each direction. Michigan’s first governor Stevens T Mason, was buried here, at age 25 he was the youngest governor in American history; Michigan’s first constitution was authored here too. Finney Hotel and Horse Barn, at the intersection of State and Griswold was one of the final stops along the Underground Railroad. 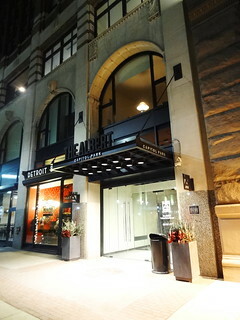 Detroit thrived, offices, shops, restaurants and residents filled skyscrapers and ornate structures, sidewalks were teeming with shoppers and businessmen. And then the buildings and streets were empty. 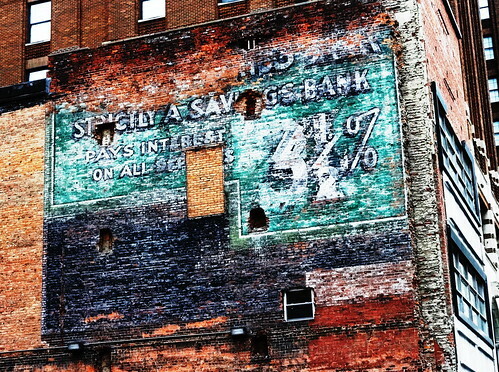 It’s a funny thing about Detroit, while the rest of the nation underwent Urban Renewal, much of Detroit was left untouched, the buildings and property had little value, nobody was interested in investing money in a ghost town. 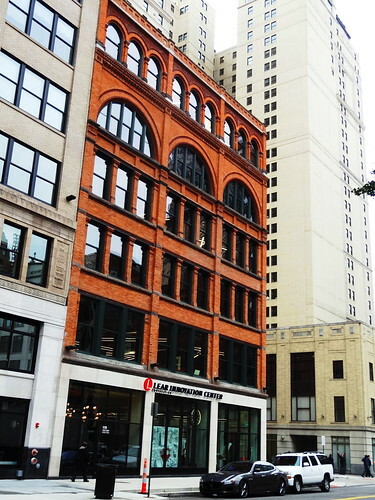 Because of this mindset, Detroit is left with a marvelous collection of early 20th century architecture. Capitol Park is a prime example; not much has changed since streetcars traversed city streets. Abandoned, windowless buildings stood silent as their facades slowly crumbled, witnessing the worst decline in America. Fortunately for all of us they persevered. Today the Capitol Park Historic District is alive and well. Buildings have been renovated or are in the process of historic renovation; scaffolding, barriers and men in hard hats are a common sight. 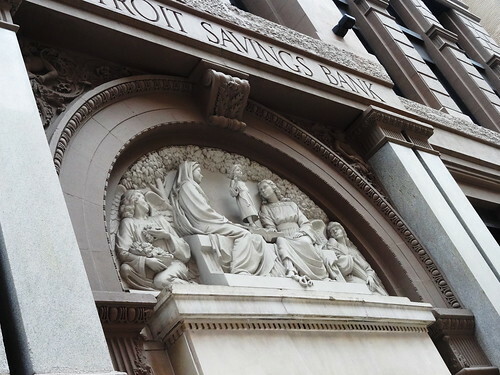 Check out the Detroit Savings Bank building, built in 1895 it’s the oldest existing high-rise in Detroit; it’s now home to 56 loft apartments and office space, it’s gorgeous. 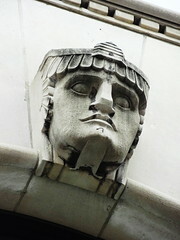 The 38-story, Art Deco, David Stott building opened in 1929, because of the Great Depression it was the last skyscraper built in Detroit until the mid-1950’s. 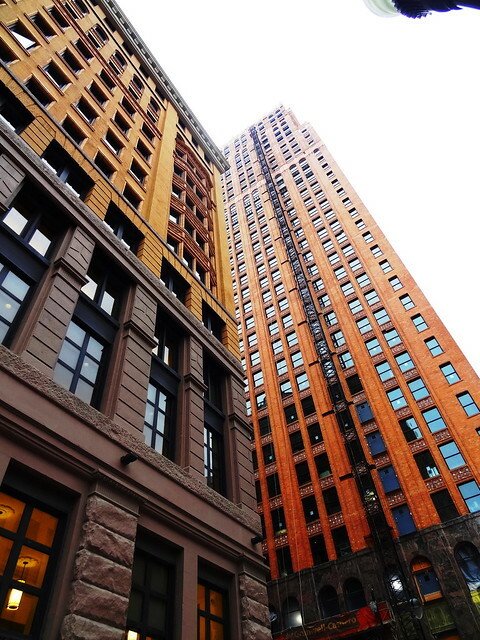 With a reddish-granite base the brick changes in color from an orangey-tan to buff as it soars skyward. You may remember the Sky Bar formerly located on the 33rd floor. Griswold is our favorite street in the city, Capitol Park, our favorite district, I love the unique sense of enclosure the buildings provide. Let’s take a walk. 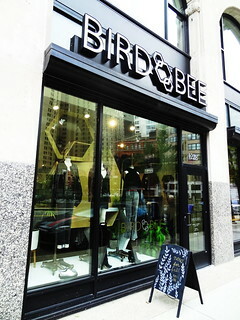 Here on Griswold there are lots of new businesses, Bird Bee is a women’s boutique filled with trendy fashions, accessories, shoes and home goods. 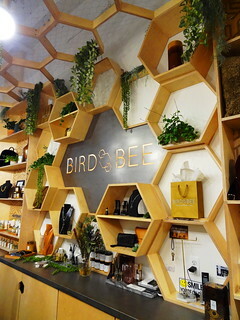 The interior is bright and airy, live plants are tucked into the honeycomb-shaped shelves behind the counter. 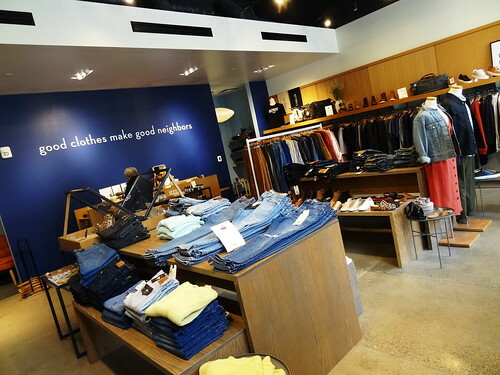 The shop has a wonderful selection of clothing from casual and comfy to business and evening wear. 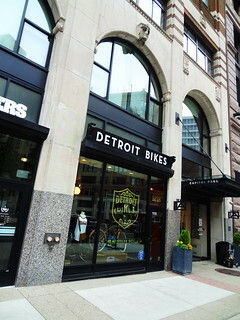 Also located on the ground floor of the Albert Building (f.k.a the Griswold Building)Detroit Bikes designs and sells bicycles handmade in Detroit using high-quality American chromoly steel. 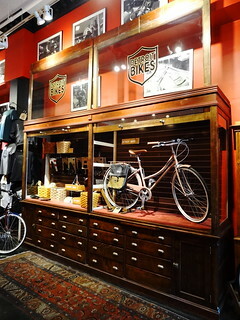 The building opened in 1929, showroom decor pays homage to the early 1900’s; red flocked wallpaper, antique display cabinets, a Victrola collection, vintage lighting; stunning. 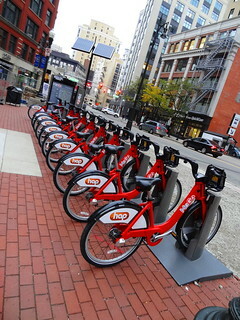 Bicycles come in Type A, B or C, they also have a versatile model called the Cortello. My favorite? The Faygo series, you know, the soda pop. 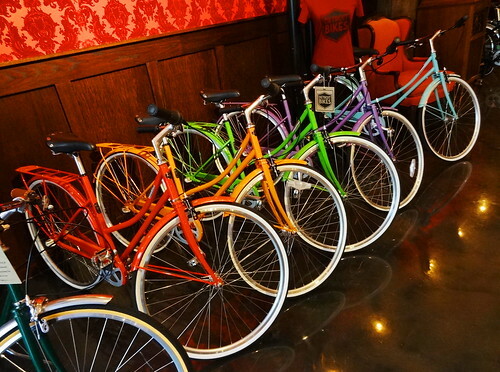 You can pedal through the streets on an Orange, Lime, Grape, Red Pop or Cotton Candy colored bike, sweet! 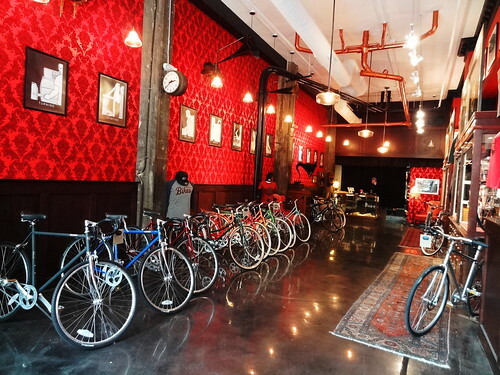 Detroit Bikes is investing in American manufacturing by making bicycles right here in Detroit. 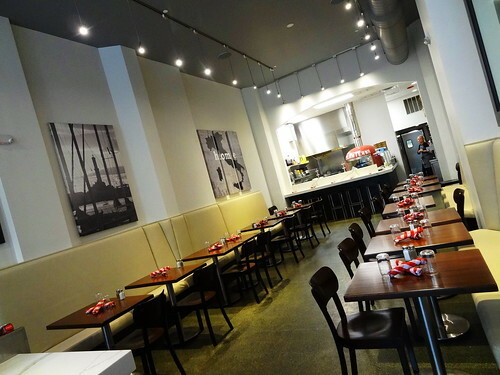 Next door is La Laterna, a pizzeria and bar featuring brick oven pizza. 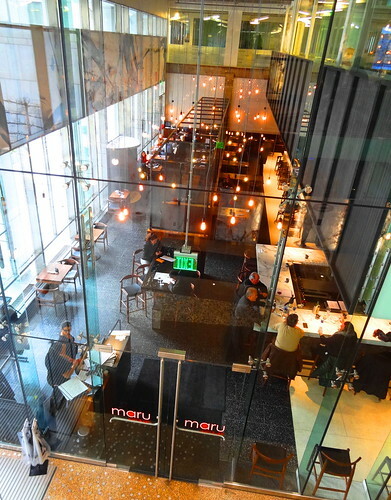 We step inside to peek at the menu and decide to stay for lunch. While we wait for our pizza I read an article in the April 1958 issue of Michigan Restauranteur that hangs on the wall. 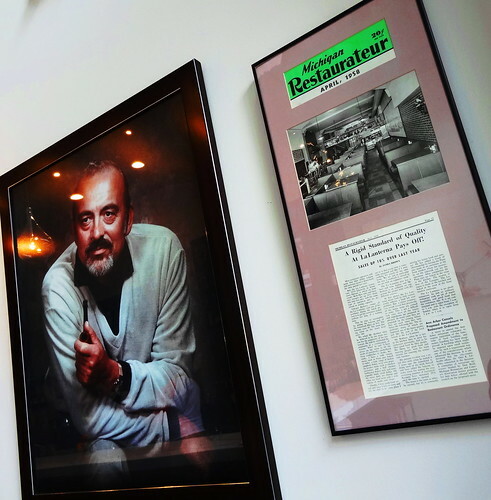 Edoardo Barbieri opened the original La Lanterna right across the street in Capitol Park in 1956, the family went on to open 3 Da Edoardo restaurants and Cafe Nini in Grosse Pointe. Now, almost 40 years after La Lanterna closed, Edoardo’s grandson has brought the pizzeria back to Capitol Park. 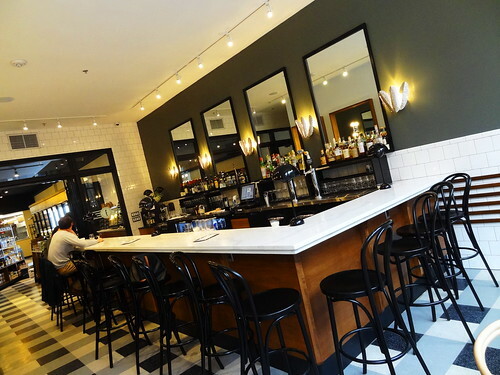 The decor is simple and attractive; stainless steel, wood, 12-seat marble bar and teardrop lighting. The centerpiece of the tiny open kitchen is the Marra forni Neopolitan pizza oven. 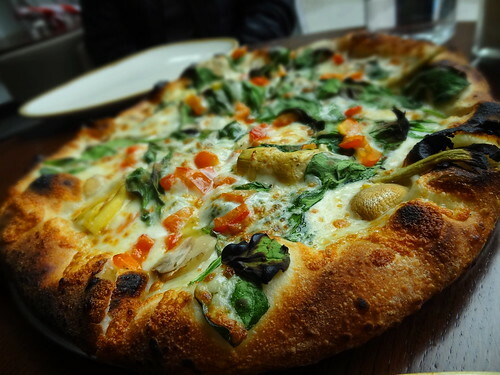 Our Primavera pizza is outstanding, the crust is tender and chewy, lots of tasty vegetables, fresh mozzarella, yum! It’s pretty cool the family business has returned to the city where it started. 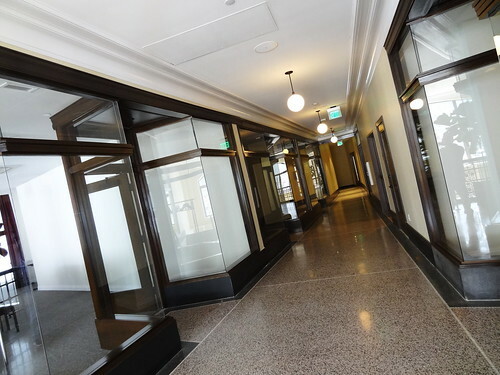 And we’re walking… The Capitol Park Building built in 1912 has been renovated into 63 apartments, Prime + Proper occupies the ground floor. The restaurant wasn’t open yet the day we were there but the staff let us take a peek inside; no expense was spared, it’s pretty luxe. If you like meat, this is the place for you. Next door on State Street, Lear completely renovated the Brown Brothers Tobacco Company Building; built in 1887 and designed by Gordon W Lloyd, it was the largest cigar factory under one roof in the world. 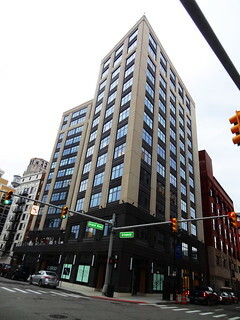 The six-story building is now Lear’s Innovation Center. 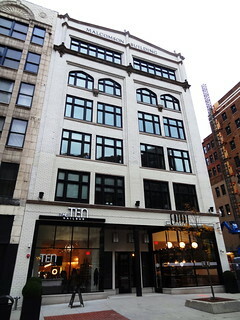 Back on Griswold the Malcomson Building has also been resuscitated, on the left side is The Ten, a nail bar, the right side is home to Eatori Market, a specialty grocer selling produce, pantry staples and prepared foods with a full bar in the front of the space. This was the original location of La Lanterna back in 1956, they managed to salvage the original metal railings and reuse them. We take seats at the L-shaped bar, the bartender offers us cocktail menus, as soon as Kris spots the distinct Blanton’s bottle his decision is made, I go for Eatori’s version of a French 75 called Violet 75, the Creme de Violet gives it a lovely violet hue, oooohh, that’s nice. 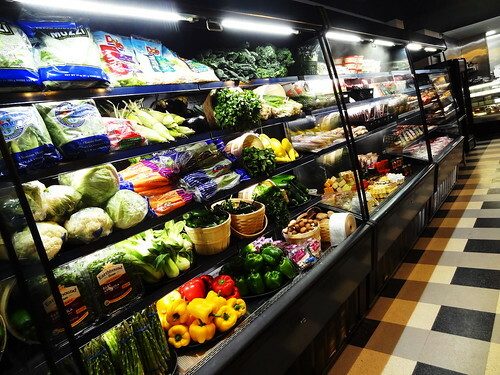 We take a walk through the market area, everything looks delicious; paninis, salads, meatballs, lots of grab-and-go items. I like the “Invisible Gentleman” paintings by local artist and singer Ben Sharkey. 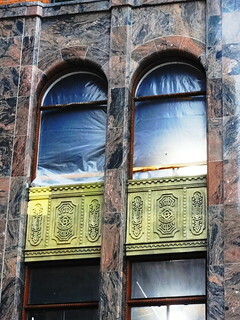 Down the street the Farwell Building is in the process of being renovated; built in 1915 the interior design was that of Louis C Tiffany, they say the brass and marble elevators were unequaled in the city. The vaulted dome in the lobby was inlaid with thousands of pieces of Tiffany glass, I can only imagine how beautiful it must have been. When finished there will be 82 apartments, office spaces, retail and a restaurant. The building on the corner wraps around the south side of Grand River, originally called the Bamlet Building, it was built in 1897. 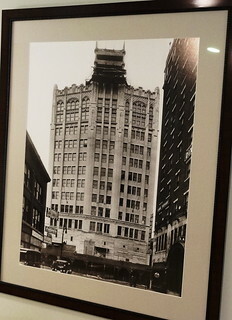 After several name changes it was finally renamed Capitol Square Building in 1931, the name has stuck. 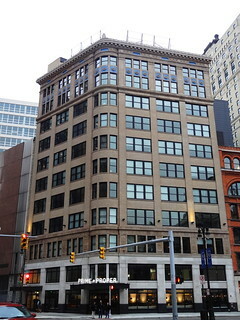 The Detroit Institute of Music Education, a for-profit college for ‘serious musicians who desire a long-term professional career in modern music’, occupies the building. I’m very fond of the way the windows curve around the corner of the structure. There’s a brand new residential building kitty-corner from DIME, a sign in another building announces Cannelle Patisserie will soon open, Loverboy Hamburgers is on the way too. Today we’re downtown to check out a couple of new places. 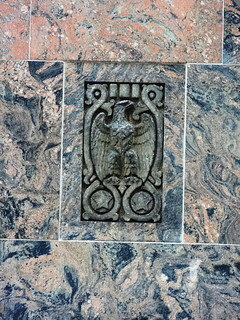 Our first stop is in the former Federal Reserve Building on Fort Street. The original building opened in 1927, a lovely three and a half-story example of Classical Revival architecture. An eight-story glass and marble annex designed by Minoru Yamasaki in the International Style was added in 1951. 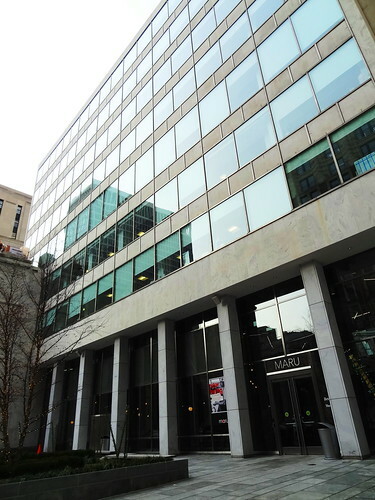 Today the building houses the Detroit News and Free Press, the Rosetti architectural firm (they did the building renovations) and our reason for being here, Maru Sushi. It’s late afternoon, there are only a few other diners in the 4,500 sq. ft space, sunlight pours in through two-story-tall windows. 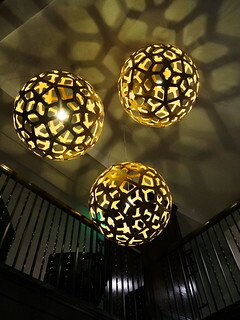 The room is designed to look like a fisherman’s net with metal netting acting as dividers and a wave-like light fixture. Japanese artwork, raw concrete walls, natural stone, marble accents, decorate the soaring, open space. 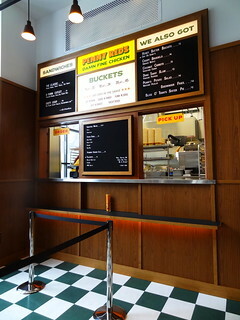 The original revolving door entrance to the building has been reinvented as a private booth–sweet. The menu is filled with rolls, sashimi, nigiri, sharing plates, soups, salads and noodles. 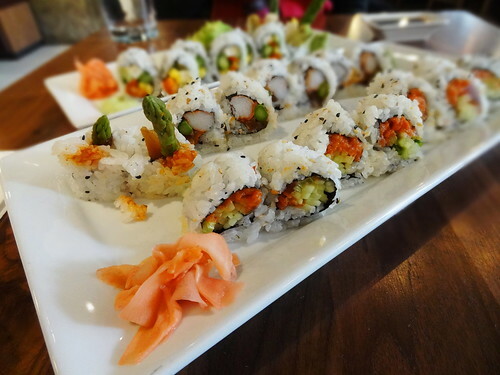 We’re having the Spicy Tuna, Flaming Crab and Archer rolls. Everything is super-fresh, nice flavor combinations and generous in size. 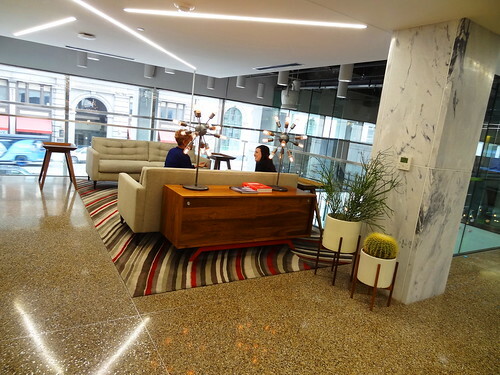 After lunch we wander around the building; the flooring is a combination of original terrazzo with new stone-like paths. 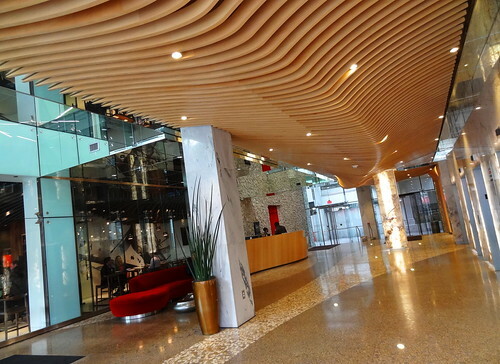 A series of wooden ribs sweeps across the ceiling, the reception desk is surrounded by mirrors, rough rock makes up a portion of a wall, bright red accents add a splash of color. 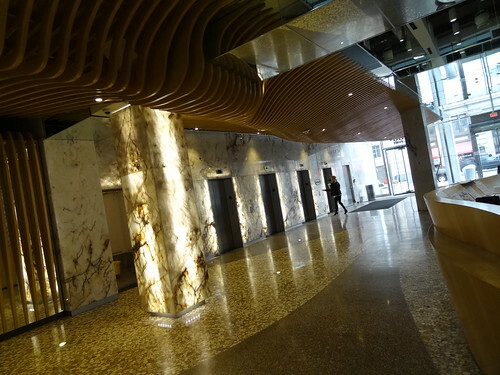 Gorgeous marble walls and columns are backlit creating a striking effect. 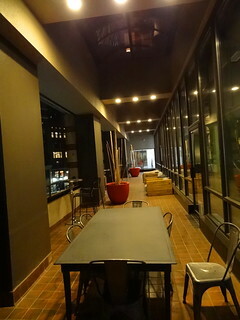 The second floor is open and overlooks the lobby, here we get a birds-eye-view of the restaurant, first floor and Fort Street; sitting areas are comfortable and attractive. I’m glad to see they maintained the integrity of the original Mid-Century Modern style. A short walk and we’re in Capitol Park. 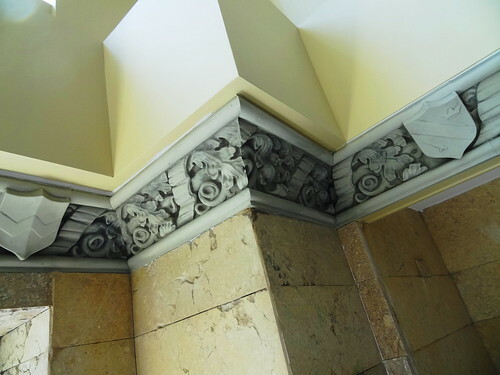 Did you know this is where Michigan’s State Capitol Building was originally located? Detroit was the state’s capitol from 1837-1847 when it moved to Lansing–hence the name Capitol Park. 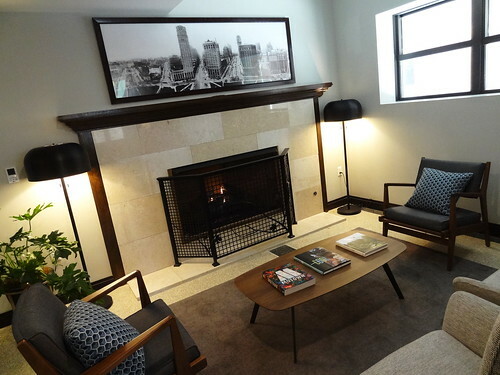 We stop in at The Albert, a 12-story luxury apartment building. 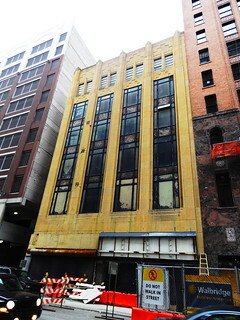 Designed by Albert Kahn (of course), built in 1929, it was originally called the Detroit Griswold Building. It went from an office building to senior apartments to 127 market-rate units and renamed after the architect who designed it. We take the stairs to the 3rd floor common areas; here residents can play games, watch TV, throw a party or just cozy up in a corner and read. 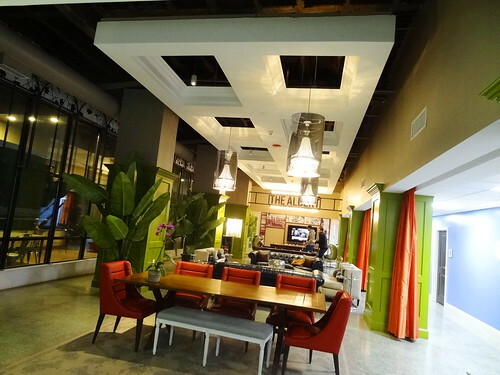 The large open space is decorated in bold colors, the outside wall is glass with a spectacular view of Capitol Park. Sitting areas, dining areas, I love the open coffer revealing the buildings original terracotta floor slabs above. The terrace offers outdoor seating and a community BBQ, whatever somebody’s cooking sure smells good! On the main floor we take the back exit to the alley, now we just have to find the right door…. 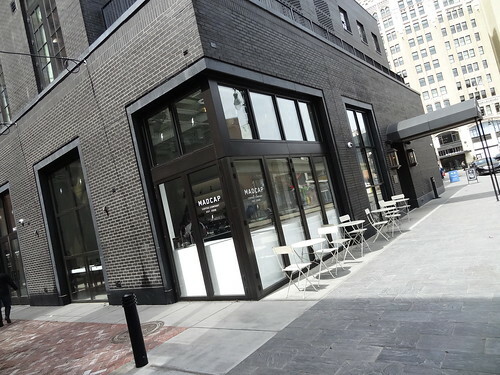 Detroit’s newest addition to the craft cocktail scene is Bad Luck Bar. The latest offering by the Detroit Optimist Society (Sugar House, Wright & Company) is definitely unique. 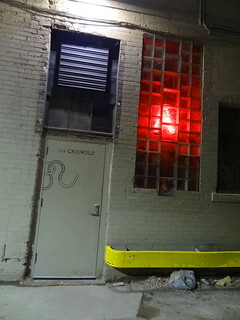 In the alley a red light glows beyond a glass block window, the snake drawn on the door below the address assures us we’ve found the place. 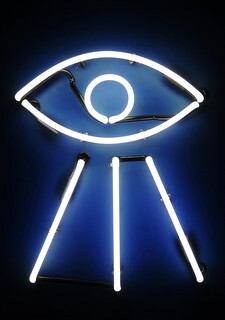 The tiny lobby is separated from the bar by a velvet curtain, a neon eye symbol illuminates the space. The host leads us through the compact, elegant room and seats at the bar. 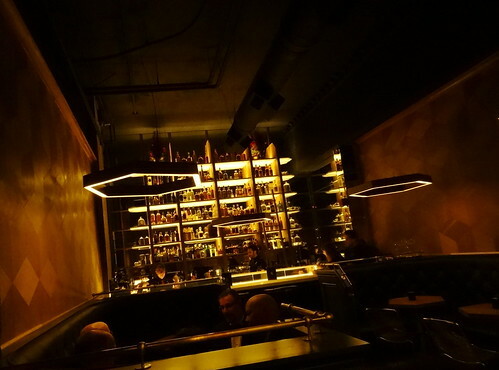 Cherry wood walls are finished with a hexagonal pattern, handmade hexagonal lights hang low from the ceiling, illuminati symbols are tucked into the decor; it feels very upscale. 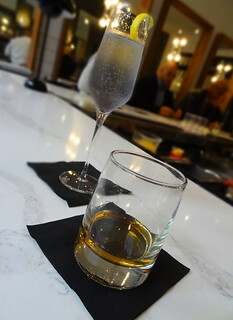 In keeping with the Bad Luck theme there are 13 choices on the cocktail menu, rare and unusual liquors are incorporated into creative combinations. We order our drinks then sit back and watch the show. 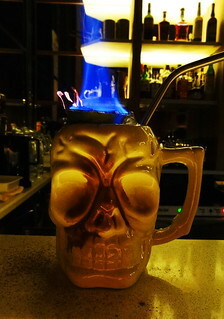 Kris is having “Death”, I can’t tell you what’s in it but when all the measuring and shaking is complete it’s poured into a skull Tiki-style glass and set on fire, how cool is that? And it tastes fantastic. I’m having the Empress, again I have no idea what it’s made with, it served in a tall fluted glass ad garnished with housemade lavender popping sugar, it’s so good! Come here for the drinks and the experience. 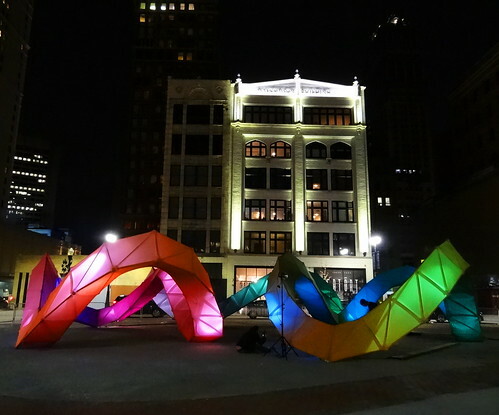 LuminoCITY Detroit runs until February 18, be sure and check it out! 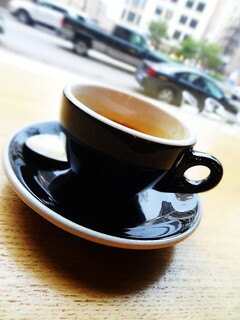 It’s hard to describe, fortunately we have good photos to share with you. 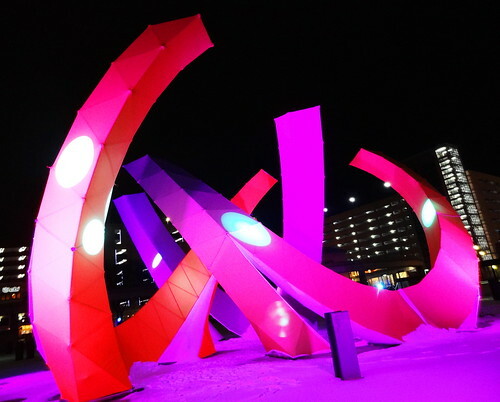 It’s called a large-scale interactive art installation experience, I call it awesome. 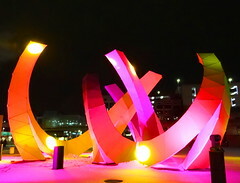 Beautifully illuminated shapes and designs of different sizes are placed in sites around downtown, they twist and flow to a curated light show. Right here in Capitol Park is Arcade, it sort of reminds me of a roller coaster; up and down, sharp turns, each section glows in a different color. Light Weaver sits on the old Hudson’s site, horse shoe shaped structures change colors, first it’s all blue then it becomes red, pink, yellow and orange, whimsical circles dance on the surface. 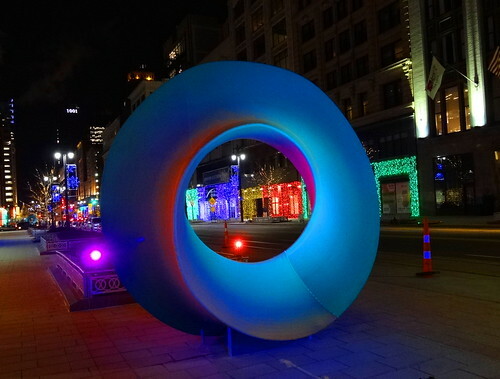 180 Beacon on Woodward is a pretty deep-blue ring, it makes me want to jump through it, which is kind of the purpose of the installation. It encourages people to walk around the city, go from one structure to the next, discover something new, stop in at a restaurant, shop or bar. 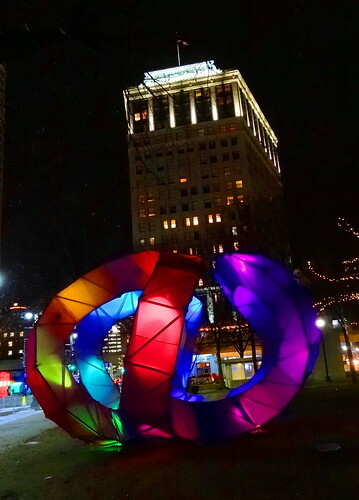 In Grand Circus Park 360 Beacons is a twist of primary colors, across the street is Gateway, the largest piece of the group. 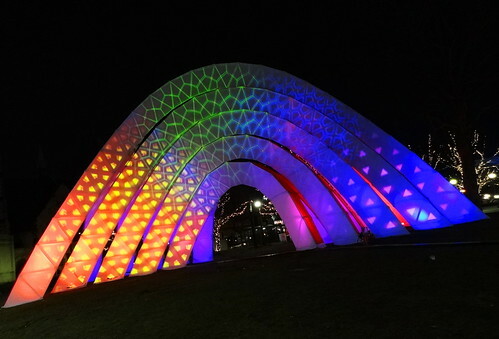 A huge multi-dimensional, multi-colored, patterned rainbow greets all who pass. We stand and watch as the color palette transitions from warm to cool, textures and shapes are projected across the surface. 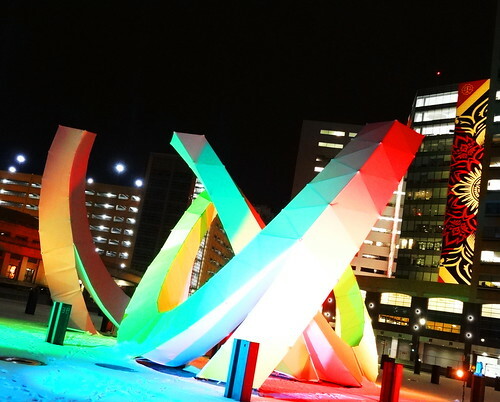 Art, technology and design working together, making Detroit a better place.